If you’ve been following our ‘How-To’ Workshop Series then you’ll know that we’ve had fun learning Hatha Yoga and Digital Photography Basics. We’ve got a real treat in store for you for our June session! Have you ever wanted to learn all about the art of bookbinding and even make your own simply bound book? If the answer to this question is, ‘Heck yeah!’, then you’ll want to attend our next ‘How-To’ Workshop, which will take place on June 18 at Central Library (10:00-11:00 am). 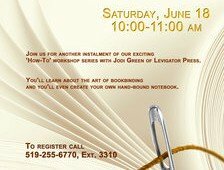 The lovely and talented Jodi Green of Walkerville studio, Levigator Press, will be joining us to talk about the fascinating world of bookbinding and show you some examples of her past works of art. She will also be instructing you on how to create your very own bound notebook to take home, use and treasure!! All supplies are included. You’ll just need to bring your creativity and enthusiasm for this interesting art form. If you’d like to attend to, please call Leisa at 519-255-6770 x3310 or e-mail lpieczonka@windsorpubliclibrary.com to register. Space is limited and pre-registration is a required.